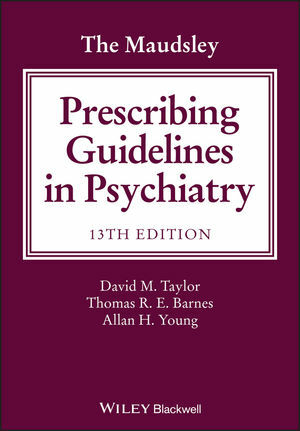 Includes referenced information on topics such as transferring from one medication to another, prescribing psychotropic medications during pregnancy or breastfeeding, and treating patients with comorbid physical conditions, including impaired renal or hepatic function. David M. Taylor BSc, MSc, PhD, FFRPS, FRPharmS, is Director of Pharmacy and Pathology at the Maudsley Hospital and Professor of Psychopharmacology at King's College, London. Thomas R. E. Barnes, MBBS, MD, FRCPsych, DSc, is Emeritus Professor of Clinical Psychiatry at Imperial College London and joint-head of the Prescribing Observatory for Mental Health at the Royal College of Psychiatrists' Centre for Quality Improvement. Allan H. Young, MB, ChB, MPhil, PhD, FRCPC, FRCPsych, is Chair of Mood Disorders and is Director of the Centre for Affective Disorders in the Department of Psychological Medicine in the Institute of Psychiatry at King's College London, UK.